The automated substrate classification model is used to quantify and classify benthic substrate by percent cover. Substrate composition provides key information on ecosystem function and can be used to predict suitable habitat for benthic and demersal species. Purpose: To develop an approach for analyzing spatial distributional data from HabCam in such a way that species and communities may be predicted with known levels of certainty at locations where HabCam data does not exist. 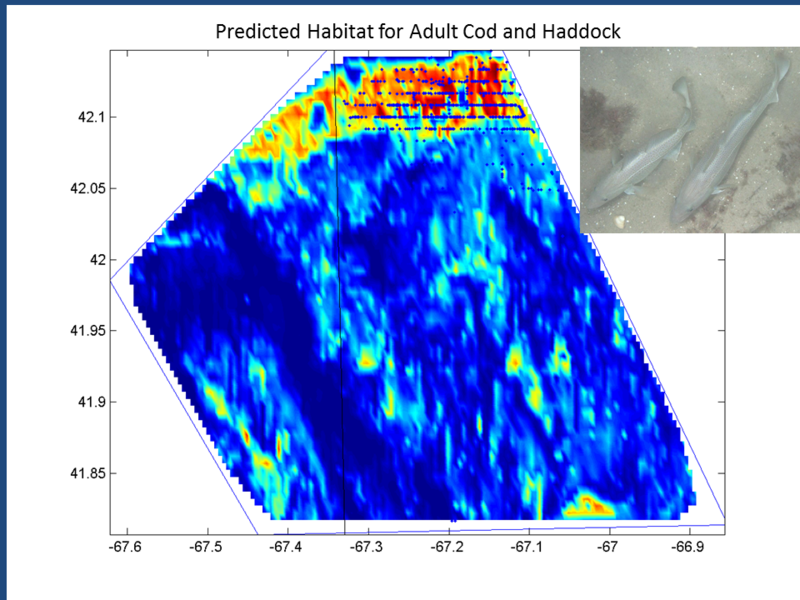 The predictive model, a boosted Generalized Additive Model (GAM), is be based on observations of co-located species/communties, substrate, geomorphology, environmental data, and multi-beam backscatter intensity. Accuracy of the predictions are assessed through cross-validation and receiver Operator Curves. 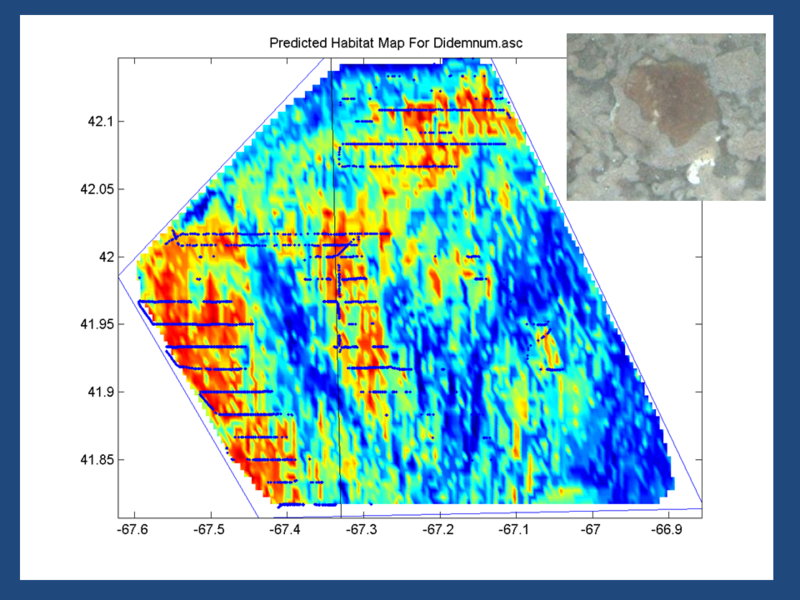 The spatial resolution of the observed and predicted data depend on along track observations of species and substrate, bathymetry grid dimensions (we will start with USGS 10m grids), and the resolution of the MIMES model requiring input from the HabCam GAM model (currently 1 km grid). Step 2. For each along track observation of a given species, sample the underlying geolocated layers of depth, slope, rugosity, profile curvature, multi-beam intensity, temperature and salinity. Step 3. Complete the same analysis as in Step 2 for observations where each species was not observed. The results of Step 2 and 3 will be a table consisting of rows representing each image processed and columns for each species and environmental variable. A given row will have a binary 1 or 0 in each species column and a floating point number for the environmental variables. Step 4. Perform multi-variate spatial clustering on species associations, including both invertebrates and vertebrates, together with all environmental predictor variables. The result of this step typically is four or more groups of organisms (communities) whos distributions are statistically related to each other and to the environmental variables. Spatial 3D plots can be generated to show the distributions of each community over the bathymetry. Step 5. Develop a correlation matrix for predictor variables to assess how well one variable explains the variance in each of the others.